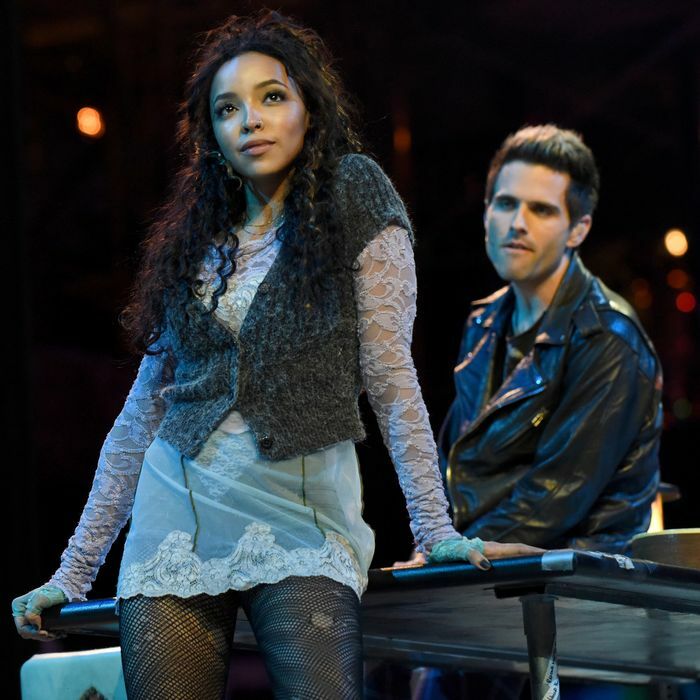 ‘Rent: Live’ on Fox Review: Why Wasn’t It Actually Live? In the immortal words of William Shakespeare, what the hell were they thinking? I don’t know if I should even call this piece a review, since I don’t believe critics should review a rough draft of a finished work that the artists never meant to be made public. That’s what most of Sunday’s broadcast was: a recording of the previous night’s dress rehearsal, up to the final break, which was done live, finishing with a singalong of “Seasons of Love” by the TV cast and members of the original Broadway cast. If you’ve ever been involved in theater at any level — or been part of a live broadcast of any scale — you know what a final rehearsal is for. The purpose isn’t to knock the audience on its tuchus with the crystalline perfection of each note, movement, and lighting cue. It’s to make sure that the cast and musicians are 100 percent clear on their marching orders and that all the technical aspects are up to snuff. It was a conceptual disaster, made all the more poignant by the fact that the cast, director Alex Rudzinski (who also helmed Grease: Live and Jesus Christ Superstar Live in Concert), and the seemingly acrobatic camera crew obviously had more to give and would gladly have given it had they known that this was the big one, the performance that everyone was going to see and pick apart. Broadcasting a recording of the final rehearsal of Rent: Live is as unfair to the production as releasing a rough cut of a movie or publishing an early manuscript of a novel and telling the public that it’s just as good as whatever the finished version would’ve been. So I’m not going to speak in detail here about the quality of individual performances or particular behind-the-scenes choices, except to say that the honest-to-goodness live portion (about 15 minutes of a three-hour broadcast) was much tighter than the recording, with much stronger, sharper voices; that the final reprise of “Seasons of Love” was spirited and moving; and that I can’t wait for my kids to grow up and leave the house so that I can move on to the next phase of my life: following Brandon Victor Dixon around the country. No, the purpose of this column is to marvel at the fact that a television event of potentially glorious corniness and elemental showbiz bravery dropped into the network’s lap, as if from heaven above, and instead of seizing on it and making something magnificent from it, they ran from it. Imagine the bewilderment, disappointment, and annoyance of Rent fans who tuned into Fox anyway, loyal to the show and the memory of Jonathan Larson, knowing that one of the lead actors had broken his foot and that the network had decided to air a recording instead (apparently, and astonishingly, Fox’s live musicals don’t have understudies), only to learn, via social media, that another production was happening live, at that very same moment, in that very same space, with that very same actor performing the role in a wheelchair. That’s what this was. One of the most amazing, out-of-nowhere, inspirational examples of “The Show Must Go On” in the history of television. And we didn’t get to see it. Check this out: They didn’t just sit there onstage with the cast and crew and the veterans of the original Rent, watching the broadcast and waiting for the right moment to jump in and finish it live. According to cameraperson Dylan Sanford, because it wasn’t feasible to redo all the choreography on a day’s notice, they created something on the spot that was intended mainly to hold the live studio audience’s attention until the very end, but that sounds incredible on its own. “The producers & cast wanted to do SOMETHING for the 1000+ audience members on the stage tonight,” Sanford tweeted. “So, the full cast (Brennin included, in a wheelchair) effectively did a high energy table read with live vocals & the band doing their best to synchronize to the broadcast.” This was 85 percent of their production on Sunday night. The rest was the cast and crew watching dress rehearsal footage of sequences that were impossible to do in the “high energy table read” format. Doesn’t that sound like something you’d talk about for the rest of your life, if it happened on any stage of any scale, from Broadway to your local community college? You can be damn sure I’d never shut up about it. I’d tell the story so many times that people would seek court injunctions to stop me from telling it again, and I’d still tell it again: the story of the time that a production of Rent was threatened by a lead actor’s broken bone — he literally broke a leg, people! — and the production performed it anyway, as a table read with an orchestra, the whole production adapting to the changed circumstance as best they could. Do Fox executives really think we didn’t want to see something like that? Do they really think we wouldn’t have made many more allowances for awkwardness and mistakes? Do they really think we would’ve watched a production that had been cobbled together from the ashes of misfortune and served up with a giving and generous spirit, and rejected it? I bet you wouldn’t have, either. You would’ve marveled at the resourcefulness, the heroism, the sheer nerve of going on with the show after something like that. Airing what actually happened last night, instead of what happened the night before, would have been consistent with the spirit of the original production, which soldiered on after its playwright died unexpectedly on the morning of Rent’s first Off Broadway preview. And it would have shown American audiences the heart and soul of theatrical performance, which consists of doing the best you can with what you have, rising or falling on the basis of talent, inspiration, and heart. Fox Broadcasting: Release the actual live performance of Rent. It’s not too late to make this right. You could broadcast it on the one-year anniversary of your mistake, which is only five hundred twenty-five thousand six hundred minutes away.